Leaning away from this topic, headcanon-wise I always liked to think zods eat fish and headz exclusively. Even with thousands of years to expand, travels with sublight speed are too slow to allow colonisation of entire galaxy. Milky Way has diamater of over 100.000 light years. Monologue doesn't says about other galaxies if i understand it correctly - it is rather a poetic use of "universe" term. Personally i always imagined Ancient empire as controlling at least hundreds, maybe thousands of star systems. The long time of ancient sublight era always made me wonder - does some of the civilisations they destroyed would not be... another ancient colonists, from ships send reeeealy far away, and changed by millenias of isolation. The Ancient monologues definitely talk about 'conquering and colonizing in galaxies where we had no place'. Sublight speed isn't too slow to colonize the Milky Way. In fact, one of the more baffling things about the galaxy is that it's not already full of life. It only takes about a million years to fill up the whole galaxy and there have been lots of millions of years before us. But there's no mention this was done before they discovered subspace. Not if the Shivans or their creators were for among the first ones to do so and wiped everybody out that discovered subspace since then. No, moving to other galaxies clearly happened after subspace. That's never been in debate. But was it necessary to conquer entire galaxy to move to another one? Systems known in FS are well... quite distant from each other, and connections between them always seemed to me random - maybe ancients simply found a node connecting two different galaxies? Expansion in FS is not restricted by normal distances, but by subspance connections... So possibly there could have been clusters of subspace trails not connected to the greater network - maybe knossoses would then serve to connect such clusters? All we know for sure is that before they had subspace, they were anticipating running out of reachable systems. I'm curious - what kind of force did the Shivans use to wipe out the Ancients? 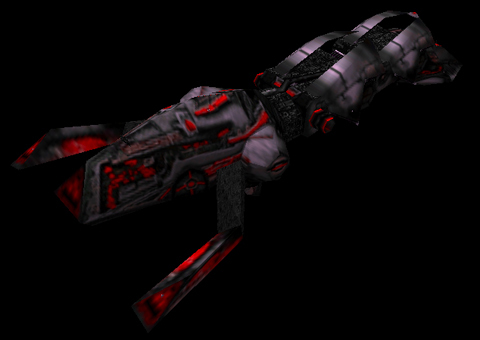 I remember INFR1 had the Vinaashak as unstoppable shielded planet killer instead of the Lucifer. Even assuming the language in the monologues is 100% accurate and includes no metaphor or errors whatsoever (which I doubt, personally) I think there are still three key assumptions in the "Ancients filled the whole galaxy at sublight" narrative that aren't necessarily true. 1. The Ancients' "thousands of years" of imperial expansion all took place in interstellar space. 2. The Ancients' definition of "reachable" meant any star system they could physically reach under any circumstances and had no other limitations. 3. Going intergalactic is inherently more difficult than intragalactic with subspace. For point 1, the Ancients' could be tracing the ancestry of their empire or society back thousands of years to a terrestrial origin (imagine a future Chinese dominated human spacefaring civilisation that traces its ancestry back 5000+ years despite only bring in space a few hundred). Once you account for the time taken to colonise a solar system on a relatively low technological base, you can easily imagine a civilisation that spent 2000 years dominating it's planet, a few hundred colonising it's solar system, and maybe only a century or two in interstellar space. For point 2, reachable might imply a bubble around their home system within which they felt they could effectively control an empire with relativistic tech. Or it might be that the infrastructure to support their empire was only available on their home system, and the recreation of that infrastructure on colony worlds would take centuries, effectively ceasing their expansion. Or prolonged spaceflight might be technologically or physiologically beyond them, putting a limit on distances they can travel, and it might not be possible to daisy chain between habitable planets if their particular home planet archetype is rare in the galaxy. When you're not talking about Von Neumann machines, there are other factors to consider when spreading out in a galaxy which might have restricted them. Finally, on point 3, it might be that intragalactic travel isn't actually any more difficult than intragalactic, it might just be that intragalactic nodes are rarer. Once you're on a paved road, for example, it's not really any more difficult to travel down to the local shops than it is to travel across a continent, assuming you have sufficient fuel. If the Ancients found a node that went intergalactic, it might be unusual that such a ring formed, but it doesn't necessarily mean they were particularly advanced, nor that they had necessarily filled up the entire galaxy and were somehow overflowing into the next. To me, it's entirely plausible and consistent with the Ancient monologues that they inhabited a large empire which they gained through relativistic means, but that was not necessarily anywhere near the scale of an entire galaxy when they first discovered subspace, and that it didn't necessarily have to grow substantially beyond that before they encountered the Shivans. I had come to a similar conclusion as in point 1 - for example the Vasudan emperor (and with him, the Vasudan Empire) was stated to be the heir of a 10.000 year old dynasty, but besides that you can wonder whether it's just an exagaration, you probably would not presume that the Vasudans have been spacefaring all the time. I would like to try and break down these monologues and nitpick on things we may be glossing over. before long we could see the day when our reachable systems would have been exploited. And then there would be nowhere else to go. 1. How much of the galaxy is "reachable"? I agree with (and piggybacking off of) Black Wolf that "reachable" probably doesn't mean the entire galaxy (sans the deep core even). Because if we're simply talking about pointing a ship somewhere and accelerating, then MOST stars in the (observable) universe are "reachable". I think that "reachable" really means "maintainable". 2. How much of the "reachable systems" had they conquered before they "could see the day..."? I would say that it is pretty low, maybe 10%, but I get the feeling others would put it at 85+%. For me, it seems like it is a far-off eventuality vs a current crisis. And we discovered subspace. It gave us our galaxy and it gave us the universe. 3. When was this? Certainly this was after the "we could see the day", but before the "nowhere else to go", right? Why would subspace "give them the galaxy" if they already had (most of) it? And we saw other advanced life. 4. Where was this advanced life? Was it in this galaxy or another? While I believe the Shivans were from another galaxy, I find it hard to believe that the Ancients were the only advanced life in this galaxy. Plot Twist: The Ancients are originally from a closed star cluster outside the Milky Way's galactic plane, Hence- the "reachable" systems and the fuzzy use of "galaxies". Also, the GTA and GTVA Refer to themselves as "Galactic" yet only have like 20 or so star systems colonized. The Ancients are painted as being more arrogant and prideful too. Also if natural cross-galactic nodes exist, and your civilization happened to be close to one, wouldn't you coo over the chance to colonize it and call yourselves a "MULTI-GALACTIC SPECIES" over and over at every diplomatic exchange? Even though you only claim 4 star systems? oh wait, no. It's FIVE, Because one of them is a binary! My headcanon is that the Ancients were only technologically ahead of the GTVA by few centuries at most, And owned only a modest portion of the Milky Way. IIRC stated that the Ancients were only a couple decades ahead of the Great War era Terrans and Vasudans except for subspace technology. Thread quickly became discussion about ancient empire, so i will write about something different to bring some fresh air. GTA was close to actually win conflict by military measures - or at least strike Zods hard enough, to cripple PVN ability to continue war. Vasudan military-industrial complex capabilities were much lower than terran, and they were forces to use Anubis, despite having better fighters simply because they could not afford to produce more comples fighters in large quantities. Also, Zods overextended in prievious phase of the war, launching several deep strike operations (remnants of these are Vasudans in Ross 128 or Betelguse), and many of their battlegroups were either destroyed, left without enough supplies or badly damaged. Terrans were in the meantime preparing to launch decisive offensive, using GTD Hades to directly strike one of Vasudan core worlds and military shipyards. Fighters and weapons we see during FS1 were actually created to be used during that offensive - new heavy fighter Hercules to replace Apollo bomber type, and Medusa bomber with tsunami warheads were in my opinion created to combat PVD Typhons. However, the GTA was rotting and internally collapsing due to failing war-time economy and civilian unrest caused by massive losses and suspension of some liberties. After eventual victory over Vasudans, these problems would probably cause collapse of GTA - also, GTI would probably try to seize power and create dictatorial state. Bosch rebelled because... GTVI was close to find out what he is planning. Before NTF rebellion Bosch was probably one of most influential military officers (in not the most one), also having strong political and business connection. It would alloud him to redirect large amount of resources to his projects (like construction of Iceni), and gather more data he needed. However he was simply too big fish, and Intelligence started to check his activities. He could not finigh ETAK in secret in time he had left, so the only choice was to start an uprising. Why te rebellion lasted 18 months, and then collapsed so quickly (even without Colossus it was quite obvious, that it is only matter of time, before NTF would be crushed. In first few weeks/months terran component of GTVA fleet was in a state of constant mutiny - entire squadrons and warships simply defected to the NTF instead of fighting them, further swelling their ranks. Also, Bosch had large number of agents or followers of NTF ideology in GTVA military, conducting acts of sabotage or gathering intel. GTVA had to conduct wide "purges" to eliminate remnants of Bosch clique in its own ranks. Later, GTVA simply did not tried to solve war quickly, fearing of inevetable losses - they simply decided to wait for deployment of Colossus - Bosch also knew about Colossus, but being not restricted be neccesity to keep low-profile he had enough time to finish ETAk. It would explain some of the odd decisions that the GTVA suffered from during FS2 between the NTF and the security shakedown needed to clear that lot out, plus the remaining sympathizers leaving the Terran half of their officer corps in something of a shambolic state. I think, between the GTI rebellion and the tech room in FS2, and how they were running about like beheaded chickens in FS 1, the GTA being a crashing out mess is basically text at this point. For thousands of years our empire expanded. For so long we could imagine ourselves alone in the universe. For so long never did we encounter advanced life. And we traveled faster and further, spreading in our galaxy and before long we could see the day when our reachable systems would have been exploited. It takes much more than "thousands of years" to colonize an entire galaxy at sublight speeds. It takes 100k years just to sent a lightspeed message to the other end of the galaxy, never mind getting a reply back. So this notion that Ancients were a galaxy spanning empire that would soon bump against the edges of it is quite absurd. Yet we do have a line about Ancients "spreading in our galaxy" here. There is a contradiction here and it does not make much sense as written. We may try to analyze it forever (Ancients being from a globular cluster or a dwarf galaxy is my favorite interpretation), but ultimately I think it is just inconsistent writing by Volition, nothing more, nothing less. Look up "Von-Neumann-Probe" and "exponential growth". It is absurd, yes. About as absurd as an FTL drive that moves you from one inertial reference frame to another. Even exponentially growing von neumann probes cannot colonize a galaxy like Milky Way in "thousands of years", as they are still limited by the speed of light. At best they can approach the 100k years limit. SD Lucifer = trident wielded by the god Shiva? The shape is similar..
You know it's possible to edit posts right? Double posting is generally frowned upon. The Shivans deployed more Juggernauts at Capella than destroyers because they were expecting very little to no resistence.